One of the best ways to maintain your keto diet is having the keto chicken salad. There are many people who are ready to make their chicken salad but the real issue is that they do not have the right recipes. 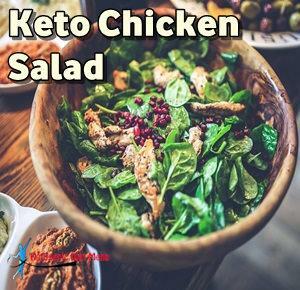 We know you want to prepare the best keto chicken salad and help you out here we have 3 top recipes that you can consider making. The best thing about these recipes is that they are very easy to make. You will get proper protein from chicken and fats from the dressing that is added to salad. You will surely enjoy the salad because of the unique flavor. Check out our special recipes and select the one which you like the most. It is one of the simplest salads that you can consider making. It is perfect for those who have a busy schedule. Here we have everything you need to prepare your keto chicken salad. You will need the following ingredients to prepare your salad. 1) Take a big bowl and mix together mayonnaise, fresh dill, mustard, garlic, and fresh parsley until ingredients are smooth. Try this simple salad with the 5 ingredients only. You will surely enjoy the flavors that you will get. 1) Add some ghee into the pan and preheat it properly. Add the chicken breast to the pan and assure that it is grilled. You can cook or keep it medium raw according to your taste. After the chicken, you have to grill the bacon slices on the same pan. 2) Take a huge bowl and add avocados, greens and ranch dressing. Mix properly until it is smooth. 3) Cut the chicken into pieces or you can keep it who as well as add the bacon slices to your bowl. 4) Add pepper and salt to taste and mix properly once again. You will surely love it. It is a special keto chicken salad with a little more flavor and taste to it. You will surely enjoy the unique flavors. 2) Add butter in a pan to fry your bacon slices. Remove once they are crisp and perfectly cooked. 3) Slick your chicken into pieces and add pepper and salt for taste. You have to fry it in the same butter properly. 4) Now take a big bowl to add your tomatoes and lettuce with the dressing. Mix properly and keep your chicken and bacon on top. It will give you the perfect texture and taste that you have wanted. Add as much dressing as you like. Make sure you try all of these keto chicken salads at least once. It will allow you to select the one that you like the most. You will be able to enjoy the salad that you want. If you want you can add your own ingredients to enhance a little off flavor and enjoy your meal in lunch or dinner.